There’s an old saying about windows. It goes something like ‘when a window closes, another opens’ or a door opens, or something – and it’s usually linked to a picture of a bunch of unicorns and rainbows or a stream with woodland creatures or something you’re supposed to like. The idea is that there’s always good news to follow an ending of something, so we should happily embrace the ‘closed window’ because something great will happen when a new window opens. Well, there’s one new window that keeps trying to open and I want it closed. Frankly, I’d nail it shut if I could. 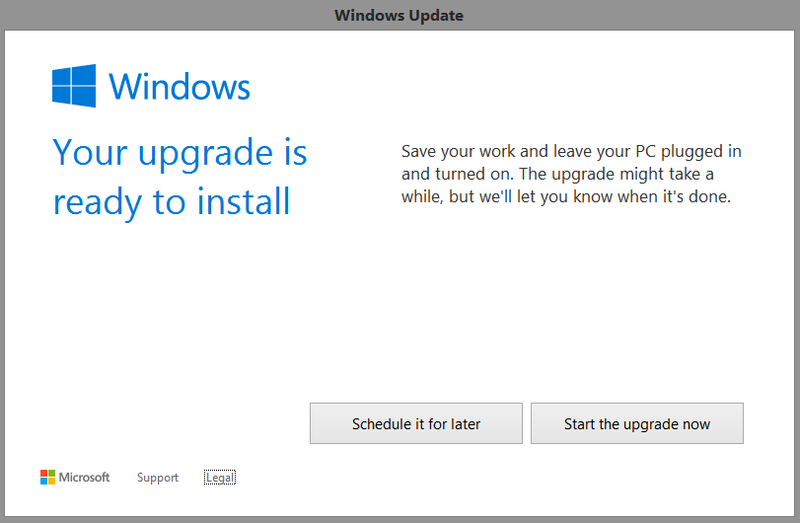 I’m resisting the Windows 10 ‘upgrade’ with great effort, but the unwelcome folks at Microsoft seem to be on the other side of my computer screen pushing it open every chance they get. It started out friendly enough; ‘Hey computer guy, how’d you like to upgrade to our new operating system for free?’. Then, after some time of ignoring them, their tactics became a bit more direct: ‘Would you like to load your new Windows 10 now or later?’. The ‘if’ part of the offer seemed to disappear. It’s not that I’m against change – heck, I LOVE change! I have a drawer full of change. The trouble with this particular change, however, is two-fold. First-fold, I hate the idea of something being forced on me without my consent or permission. It just showed up one day and it won’t leave. I want to be able to decide what operating system I work with. Who are they to tell me that I need to change how my home screen looks and feels, and I sure don’t want to have to ask ‘Cortina’ where all my files went. Full disclosure; I’ve been accused of being a control freak, demanding that things be done my way. Shocking, I know! But I don’t really need to control things…except maybe how the dishwasher is loaded, how shopping carts are driven, how groceries in those shopping carts are organized, how the grass is cut, how other people drive, grammar…really nothing at all. But my computer, my personal computer, should absolutely be controlled by me. If not my computer, then what? The second problem is that I spent 2 years figuring out where the stupid ‘shutdown’ button is on my current operating system. 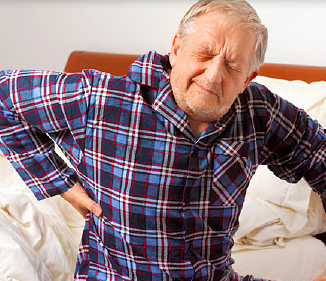 What contortions will I have to go through with Windows 10? Will I have to ‘control-alt-delete’ to do anything? What other ‘new’ things will take up hours of otherwise good web-surfing time? Why can’t I choose to keep this window closed? I’m not buying the bunnies and unicorn thing on this new window idea. This is a change for them, not me. 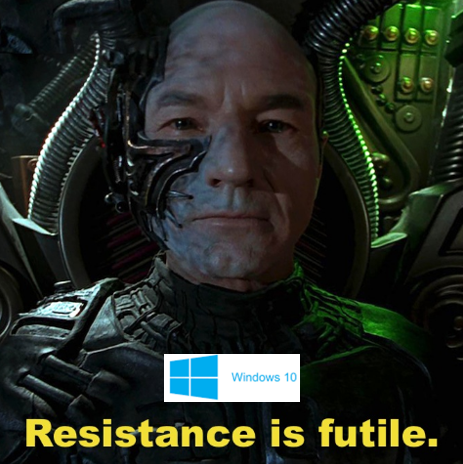 I can picture those pasty Seattle-tanned autobots smiling fakely at me like the Borg, telling me that ‘resistance is futile’ and ‘I will be assimilated’ into this new world of Windows 10. But I will resist as long as possible. I will force computer shutdowns instead of allowing this evil new system to invade my safe world of Windows 8.1, risking that 1 in 100 chance that I could lose everything. No, Mr. Microsoft, I will not go quietly into the night. 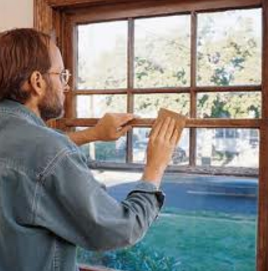 You can keep your new window closed, thank you very much. Of Course I’m Right! Just Ask Me. Sometimes, people ask for my opinion on stuff. I can only assume that they intend to heed my advice, otherwise why would they ask? That’s the burden. My advice, answers, perspectives, thoughts, and even emotions can be a pretty serious contemplation – especially knowing that future generations will in some small way follow my lead. That’s a lot for one man to carry. On the upside, I always know I’m right, so there’s comfort in that. Now, you might be saying ‘Wow – what an ego on that guy!‘, but that’s not true. In fact, I pride myself on my humility. The thing is, if I thought I was wrong, I wouldn’t offer advice. None of us would, unless you were some sort of psychopath and deliberately gave people bad advice just to mess with them. Your opinion is the currency of how others appreciate your wisdom and intelligence. There are times of course, that I may have no opinion at all. If I was asked if I preferred knitting or crocheting, I would have no clue, since I neither knit nor crochet. In this case, I would be confident in saying ‘I have no opinion on that topic. You should ask someone else’. Even in saying that, I’m showing that I’m correct in my advice…to not take my advice. See how that works? But it’s not always that simple. Sometimes, I will be asked for my advice then have it questioned. I don’t know why. If someone wanted my opinion, why then would they choose not to take it? Let me give you a hypothetical example that in no way reflects any actual events. Let’s pretend that my lovely wife is picking out a dress for a party. She holds up 2 outfits and says; “The red dress, or the blue one?” She’s asking my opinion, presumably because she understands that I have some fashion credibility and she clearly wants to look her best standing next to me. I need all the help I can get. I tell her “The blue one”. That should be it, right? Asked and answered. Conversation over, decision made, I’ll be waiting in the car. You’re welcome. “Really?”, she’ll then say. What? Why is she questioning my decision? Even if I was’t paying attention or watching TV when she asked, I’d have at least a 50/50 shot at getting it right – pretty good odds. “Why the blue one?“, she would go on to ask. Uh, oh. Not only has my input been brought into question, now I’m being asked to back up my decision with facts. “Because I like the blue one on you”…I may leave out the fact that we’re already late and the blue one looks like it doesn’t need ironing. This is how I balance promptness and self-preservation. “But the red one goes better with my shoes”. Now we’re treading into deep waters. If I rescind my original decision about the blue dress, I soil my reputation as being decisive and correct, and my currency begins to devalue. On the other hand, if I hold fast, we may miss the hors d’oeuvres altogether. “Okay, the red dress does look better with those shoes. Wear the red dress.” I reply. This doesn’t negate my previous position on the dress. New information was brought to my attention after the fact, which changed my position. Good judgement still intact, and my currency stays afloat. My reputation for promptness however, will be pocked, but sometimes you just gotta go with it, right? “But you liked the blue one better.” Sheesh! “Not with those shoes.” I should play more chess – I’m a genius! “Maybe I should wear the blue dress and pick out another pair of shoes”. Touche! This is no longer an opportunity to offer input, but a battle of the minds. I wished I had grabbed a snack when I had the chance. This hypothetical tarry could go on for hours…hypothetically. But that’s the point of my dilemma. If I’m asked my opinion, I offer it and expect that to be taken with the utmost consideration. That’s not always the case. Sometimes, my opinion is nothing more than an opportunity to be an external ‘internal voice’ to be questioned, rebutted, and occasionally outright rejected. That’s a hard pill to swallow when you’re always right. You put real thought into offering your input. When it’s questioned or rejected, it makes you just a bit less sure of yourself. And that’s dangerous. The acceptance of your opinion bolsters your currency. If it’s discarded, it makes you less valuable, doesn’t it? On the other hand, if you know you’re always right – like I do – maybe it’s more of a reflection on those who reject your input that on your wisdom (previous hypothetical scenario notwithstanding). But that’s just my opinion. Oh, and just in case you were wondering, my wife wore a black dress, looked beautiful in it, and we missed the hors d’oeuvres. Hypothetically. If you grew up in Canada in the ’60’s or ’70’s, it’s likely you spent a lot of time outside. Those were the days when the big rules at home had to do with being within ‘ear-shot’, meaning your mother could yell your name from the front door and you could hear her…naturally, if you were playing hide and seek, you couldn’t give up your location, so you had to weigh the odds between being caught or being in trouble with Mom. Before you all rush around making ridiculous and unachievable resolutions to live better, lose weight, stop smoking, reduce smuggling plutonium, or tackling whatever other demon plagued you last year, you should heed my realistic advice. There’s nothing worse than gearing up all through the Christmas season with weight loss, reduced vices, treating others nicely, then finding out you’ve over extended your self-motivation and can’t do any better on January 1st. 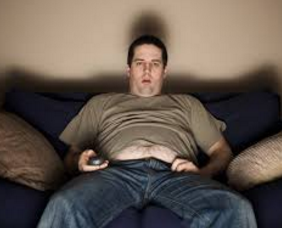 You should start around Halloween with over-eating, smoking 3 packs a day, drinking on the job, etc. That way, if you even go back to more normal self-destructive patterns, you’re way ahead of the game! 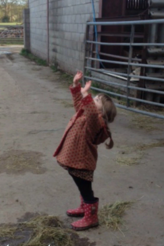 “Reach for the moon! You may not get there, but you’ll be among the stars”…what a bunch of fertilizer! How can you reach for the moon? Most arms are no more than 3′ long…the moon is over 200,000 miles away. Not gonna happen. And the ‘stars’ are WAY farther away than that. How can you be among the stars if you couldn’t even get close to the moon? It just doesn’t make any sense. Guaranteed failure. Reach for the fridge – it’s right there in your house…even has a handle on it, made just for your tiny little arms. I bet you can achieve that goal without looking like a lunatic. Sure, the so-called experts will tell you that getting your friends and family to help you with your goals will help with networking and support. How has that worked for you so far, my friend? By telling everyone, you just set yourself up for public humiliation when you do fail. Not a great motivator, is it? Tell them something that you know you can achieve without even trying…like ‘I resolve to enjoy my leisure time more in 2016’. See? That’s something you can get your friends to cheer about when you spend an entire weekend on the couch, binge-watching Supernatural on Netflix! If your real goal is to double your income, lose 40lbs, and feed the children on the streets of Calcutta, you’re not only going to fail, you’ll disappoint your friends. Don’t disappoint your friends. In the end, we all want to find a way to improve our lot in life….let’s not set ourselves up for utter failure. Make small, ‘fall-off-a-rock’ simple wins that may help us just feel a tiny bit better about ourselves. Doing that may just help us to stretch our tiny little arms a bit closer to that stupid moon. Hi! Too busy hollying and jollying to write another pre-Christmas blog, so I’m re-gifting this from last year. Twas the month before Christmas, and in my garage; the decorations crashed down in a thund’rous barrage. The kids had all vanished like a Copperfield trick; and my hopes of assistance were dashed in a lick. The weather it whistled and howled bitter cold; “Get your lights up early“, my neighbour foretold. In full winter gear, I yanked and I tried; to get at the boxes in the rafters I plied. 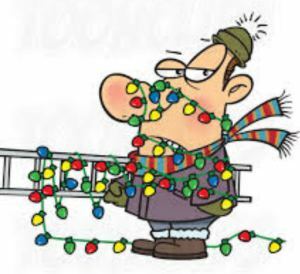 With my ladder in hand I began to finesse; and sort all the lights and bows, what a mess! They tangled and fought at my greatest attempt; to free them but they were so filled with contempt. The wind it picked up as if right on cue; and tossed the decors while I watched as they flew. The darkness descended on my efforts outside; “Turn on the porch light” I yelled to my bride. Since early spring, I’ve been tormented by some sort of ground-dwelling, grass-killing, hole-digging, super-stealthy, pesky critter. 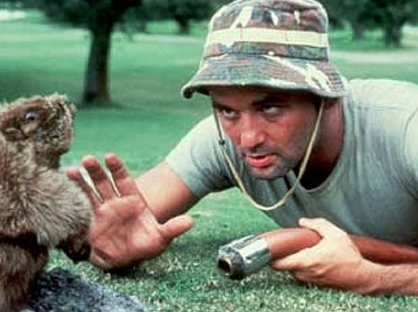 I’m starting to feel like Bill Murray in Caddyshack. It digs a hole and I fill it with rocks. Next day, there’s a new hole next to it that I stuff with bigger rocks…rinse and repeat all summer. You get the picture. Last week out of sheer frustration, I dug up the hole and packed it with a secret weapon that was sure to chase away anything from duct-cleaning salesmen to zombies. Something so putrid and horrible that no living (or un-living) creature has ever been able to tolerate it – moth balls. That is, except for one. My father. 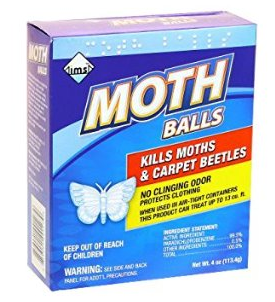 For him, moth balls were like little air fresheners. He’d buy boxes of them and scatter them liberally in dresser drawers, storage bins, closets and unfortunately for us, our hockey bags. Hockey bags smell bad enough on their own, but add in a dozen of those nasty little white balls, and you’re guaranteed to get lots of personal space in the locker room. You had to put up with the teasing from the other kids too…or worse, finding one of them lodged in your ‘athletic protector’ while you’re on the ice. I’m sure his original motivation for applying those stinky balls to everything was to discourage critters from turning our stored items into a rodent hotel, but I think he started to really like the smell and eventually started spreading them around the whole house. But as bad as moth balls smell, because of our life-long exposure to them, they do bring back some pretty cool memories of our childhood, and of Dad. Arriving at our summer cottage up north, we’d open our drawers to put our clothes away, and find a dozen or so moth balls rolling around in there. We didn’t take them out either, so all summer, we were free of those pesky moths just by walking around. I don’t even remember ever seeing any moths growing up. I guess they must have worked! It’s funny how we connect smells to hidden memories – even bad smells. I still don’t really like the smell of moth balls, but when I do get a whiff, I’m flooded with long forgotten thoughts of an amazing childhood…except for the hockey bag of course. Oh, and the moth balls in the rodent hole in my back yard? They dug a new one…again. What is it about us humans that drives us to take a great invention and make it worse? Take the ‘spork’ – half fork, half spoon. Did mankind really need to streamline the eating utensil process to the point where we couldn’t handle using different implements to stuff our face? Forks are great. They hold the food down while you cut it, or stab the food so you can pick it up and eat it. Spoons have that nice concave shape that cradles your favourite soup or pudding. Beautiful and simple. Then someone ‘Frankensteined’ them together. Now fast-food restaurants have made the messy, guilty pleasure of eating crappy food and turned it into a horrible sport. To save a couple of cents per thousand on spoons, they came up with a blasphemous cross-breed utensil that doesn’t fork OR spoon well. What they maybe didn’t calculate is the huge increase in paper towel costs because of this bastardization of two perfectly working eating utensils. 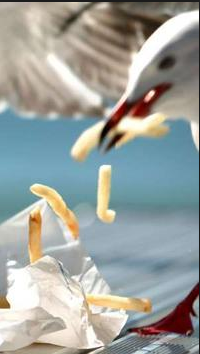 About the only winners in this failed experiment are the seagulls hovering around outside as your ‘spork’ tries in vain to spear your french fries. 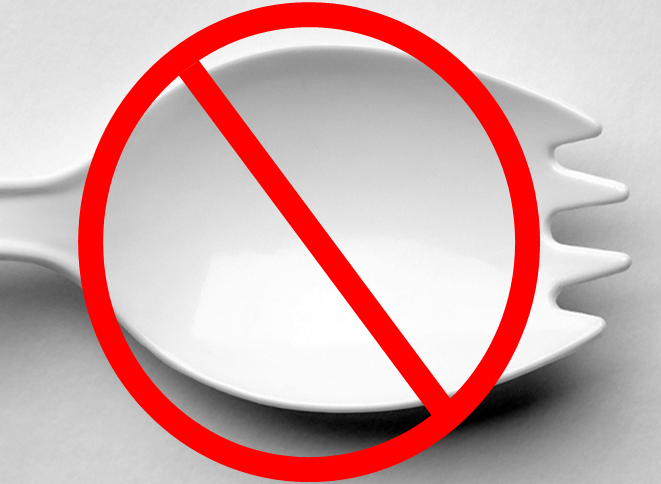 Don’t even get me started on trying to eat soup with a spork…maybe dry cleaners like sporks as much as the seagulls. This planet was just not made for ‘multi’ tools. There’s an order to nature that we just need to stop trying to mess with. 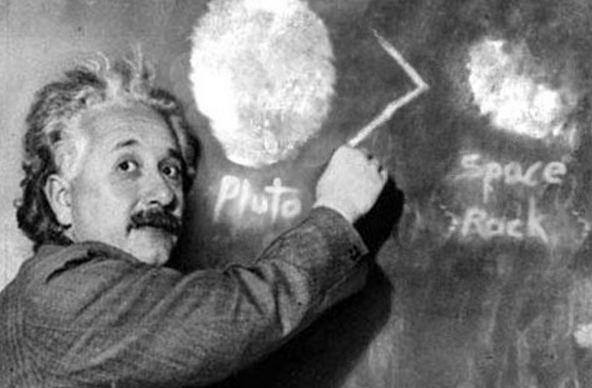 Everything has a purpose and when we combine more than one together, we end up with less than the sum of their parts. How about sofa beds? Same thing – they took two perfectly working pieces of household furniture and turned them into something awful. They’re uncomfortable as hell as a couch, and is there ANYONE on this planet who thinks they’re a great idea for a bed after spending the night on one? I guess if you don’t have a spare bedroom, you might consider one, but I can guarantee that you won’t have any long-term guests with that torture tool sitting in your living room. It’s like multi-tasking. Anyone who tells you they can multi task is a liar! All they do is more than one thing really badly. I know – my wife calls while I’m typing. I can’t do both even though I think I can. She knows when I’m doing something else while talking to her on the phone, too. She’ll ask about what we’re going to have for dinner and I say “Sure – sounds good“. Huhh? So, next time someone tells you they can multi task, stab them with a spork!